"Going in and occupying Iraq, thus unilaterally exceeding the United Nations' mandate, would have destroyed the precedent of international response to aggression that we hoped to establish. Had we gone the invasion route, the United States could conceivably still be an occupying power in a bitterly hostile land." George H.W. Bush (Bush senior) and Brent Scowcroft in their 1998 book, "A World Transformed"
Marine Lance Cpl. 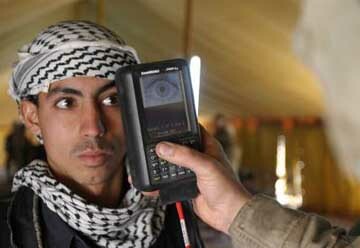 Luis Molina scans an Iraqi citizen's retina at Brahma Park in Fallujah, Iraq, on Jan 25, 2005. U.S. Marines are utilizing a Biometric Analysis Tracking System to record and identify Iraqi civilians entering the battle torn city of Fallujah in an attempt to find and identify insurgent forces. The tracking system uses thumbprints, a photograph of the face, and a retinal scan to establish positive identity. Molina is deployed with Marine Wing Support Squadron 373 in support of Operation Iraqi Freedom. DoD photo by Staff Sgt. Jonathan C. Knauth, U.S. Marine Corps. BAGHDAD (AP) — Iraq is opening more of its untapped oil and gas resources to foreign developers, hoping to boost revenues after its costly war with the Islamic State ... Iraqi forces concluded major military operations against the extremists last year, but large parts of the country were reduced to rubble. BAGHDAD (Reuters) - Air strikes carried out by the United States, France and Britain against Syrian military targets could give terrorism an opportunity to expand in the region, the Iraqi foreign ministry said on Saturday. The air strikes marked a "a very dangerous development", the ministry said in statement. BAGHDAD, Iraq - Campaigning began Saturday for Iraqi parliamentary elections with some candidates embroiled in controversy after aides pulled ... Social media users cried foul as pictures of politicians, referred to by some in Iraq as "thieves" over allegations of corruption, replaced those of combatants. Will Iraq's new 'tribal court' undermine rule of law? His political evolution could have far-reaching consequences for the next Iraqi government, the country's fractured Shiite political class and Iraq's relationship with neighboring Iran. In Iraq, the new alliance asks Sadr's followers to take a major leap of faith in abandoning religion as a basis for voting. Iraq plans to award oil and gas exploration and development contracts in 11 new blocks on April 15, oil ministry spokesman Asim Jihad said on Sunday. Iraq had initially set June 21 as the date to open the bids for the new blocks, located in border areas with Iran and Kuwait, and in offshore Gulf waters. The Iraqi military has been ordered to take full control of the country's borders amid Turkish threats of an incursion into Iraq to track down Kurdish rebels. ... The Iraqi prime minister said that any attempt by 'foreign fighters' to launch cross-border attacks on Turkey will be prevented by the Iraqi military. Girl Blog from Iraq... let's talk war, politics and occupation. mother: Faiza, sons: Raed, Khaled and Majid writing down their diaries. Father: Azzam is not interested. Where Kurds are given their full self- determination rights in order to create a peaceful Middle East. Troop movements, US weapons, etc.